Note, this is for “my” version of the 2000 2RZ. There are also CA spec and newer motors, which are coil-on-plug, so your mileage may vary. What are the differences in Megasquirt units? Injection out – How will you drive your injectors? Low impedance? High impedance? Batch injection or Sequential? Ignition out – What type of spark will you use? A single coil? High current, low current? You need to understand all of these things, have a design for them, and understand WHICH megasquirt unit supports your design. Within that megasquirt unit, the design for those particular options make change the circuits. Each design has separate software settings within TunerStudio. And choosing the wrong option can result in destroying components – on megasquirt or burning up something under your engine bay. OK, I understand what I need! Prices range from: $269 for Megasquirt-I to $659 for Megasquirt-3 with an expansion board (MS3X). If you know the 3 categories of stuff that I outlined above, simply call them up and they’ll give you the support options. First, I’ve never built megasquirt myself. I’m an electrical engineer by education and I consider it a moderately complicated task as an electrical engineer. I wouldn’t recommend it unless you’ve done board level repairs and are very detail oriented. These manuals can tell you, for your type of unit, what you need to do to support your tach in, injection out, and ignition out designs on your unit. My engine (2000) is a “coil pack” motor. Prior motors, < 1999 were distributor motors. I find distributors distasteful. They’re a bit inaccurate due to mechanical timing slop and the distributor that’s in some vehicles (like the 22RE) has 4 pickup points. So it can give you 4 points of accuracy in 720 degrees of rotation. That’s not very accurate. Side note – with two ignition triggers, you can MS3 manual for the different combinations, page 116. It appears that both of these sensors appear to be VR type sensors. That is, they’re shown as 2-wire sensors in wiring diagrams. In reality, if you gut the harness and the connector, there is 3 wires, so it’s confusing… The 3rd wire is a shield/ground. Actual OEM sensor. 3 wires at the connector. 2 wires at the sensor. 2 wire sensors, the 3rd wire is a shield/ground. VR Sensor: If 2 of the wires from the sensor have continuity (probably some number of ohms <400) regardless of which order the red/black leads are connected, it is probably a VR sensor with a shield. Hall Sensor: If 2 of the leads show continuity one direction and shows open when the leads are reversed, it is probably a hall sensor. Note Paradise racing has a “kit” to convert over to digital sensors (hall sensors), which would likely be more a little easier to use. P1 jumper across positions 1 and 2 enables the variable reluctance (VR) circuit. For my setup, I found that I went 7 turns anticounterclockwise on R52/R56 and then one turn clockwise. Pots (shown below as “Adjustment for Cam Input) need to go 7 turns anti-clockwise. For mine, I went back clockwise one turn. Blue is the crank signal. Green is the cam signal. This is a nice VR signal. It’s about 2.2 volts peak to peak and 2ms/divison at cranking speed (no plugs). If you have this signal, MS3 is getting the trigger from the crank sensor. You should adjust your pots. From the factory a 30v signal feeds the tach from the ignitor, what varies is how often that 30v is fired. MS3X provides a “logic level” – varying frequency square wave at 0-5v or 0-12v, which might work if we can get the tach to trigger at that voltage. Will an MSD 8920 Tach adapter work? This worked for Jeff Most (22RTE) and a FAST EFI system. Here’s a great thread on everything tach related. MS3x DIYAUTOtune tach output is 0-12v, but can be jumpered to 0-5v. If you actually scope the signal from the 22RE igntor, here’s what you get, which looks like 30V AC signal, note the frequency. It looks like a 10k resistor 10K ohm 1/4 watt resistor and typical tach output may work, it works for the guys doing 2rz / 3rz conversions with stock EFI. Note this mod places a resistor in parallel with the stock resistor, which allows the lower voltage to be picked up. In an effort to keep things “stock” looking, I drilled and tapped a 3/8″ NPT hole on the underside of the upper intake. You can buy the IAT sensor from DIYAutotune (with pigtail) – it’s about $20. Megasquirt considers the toyota coils to be 3-wire (the 4th wire is unused) “logic level” coils, as they already have an ignitor. Diagram – note ground color is wrong. General MS note: MS output to “IGT” terminals on the Toyota ignitor. “IGF” is not used. Fire them from the MS3x card. Coil 1+4 (front most coil) will go to Spark A (pin 14) output and Coil 2&3 will go to spark B (pin 33). Outputs are fired in order: ABCD. So we’ll fire AB, AB, set it to wasted spark. To use these, TunerStudio, click ‘Tools > Calibrate Thermistor Tables’. Make sure ‘Coolant Temperature Sensor’ is selected at the top. You should calibrate it properly from TunerStudio in the ‘Tools’ menu. Choose ‘Calibrate TPS’. Make sure the engine is off, and the key is on. With your foot off of the throttle, click the ‘Closed Throttle ADC Count – GET CURRENT’ Button. Put the throttle to the floor. With your foot fully depressing the throttle, click the ‘Full Throttle ADC Count – GET CURRENT’ Button. The 22RE, 22rte, 2RZ, and 3rz all use 11mm injectors. If you just want to go buy a set, a good vendor is OsideTiger, who has 540cc/min 11mm injectors for under $170. These come with injector pig-tails. They get their injectors from Nikki in Japan. 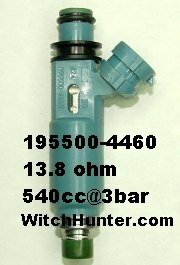 Witchhunter has a good page on different injector connectors. Stock injectors use a “Japanese oval” type connector.. And they have a good injector flow rate guide. Here’s another good guide – with some application information. 1995 – 9/2000: “blue top” PN 23250-75040 ~265cc/min @ 43psi. Denso top feed. Should be around 14 ohms. Denso connector. 10/2000 – 2004:”pink top” PN 23250-75080. ~325 cc/min @ 43psi. Denso top feed. Should be around 14 ohms. Denso connector. Bosche EV1 type (left). Denso type on the right. Mazda RX7 Denso 460 injectors are labelled 195500-1350 (both low and high resistance models). Mazda RX7 tan top Denso 550 injectors are low resistance with a center notch in the electrical connector. Mazda RX7 purple top 550 injectors are high resistance with an offset notch on the electrical connector. Both of these 550 injectors are marked 195500-1370. 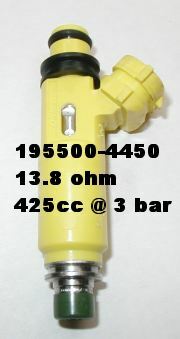 Toyota injector impedance can be identified by the connector, connector guide away from the clip = low impedance, connector guide near the clip = high impedance. To do sequential, you need to wire injectors to the MS3x output (above). However, you can’t do this if you have low impedance injectors. MS3 supports only semi-sequential, but will do low impedance injectors. See: MS3 manual on impedance. The 2rz has a 3-wire PWM type idle air control mounted under the throttle body. It’s a PWM (Pulse Width Modulated) idle valve that has two directions: Forwards (higher idle) and backwards (lower idle). The 2RZ/3RZ uses a PWM IAC, which requires megasuirt modification for V2.2 and V3.0 baord. It is not needed on PCB 3.57 SMT ECUs. The dropoff at 170′ in the ‘PWM idle duty cycle’ settings essentially turns off the IAC once the engine is warmed. And alternate solution would be to use the custom IAC that DIYAutotune makes along with a Jeep IAC (just connect to a vacuum port). Total cost? Around $100. I’m going to keep the 4runner as “original” as possible and use existing wiring. I gutted the wiring from the Tacoma harness, basically traced wires from sensors back to the ECU connector and cut them off. The tach “input” wire is on the drivers side, connected to the igniter. It’s a green plug with a Black and Black/Red wire. The tach input is Black. Connect this to MS3 tach out. Here’s the diagram of the factory 22re igniter / coil setup. I don’t care about all that.. What did you do? I bought an MS3X unit from DIYAutotune. That unit is here. You can do what I did below with an MS3 or even an MS-I with the right hardware. I chose to do batch injection, mainly because my 1998 4runner wiring only supports one batch of injectors. I chose to do crank trigger for a 36-2 wheel. Truck came with it. I chose to do “wasted spark” – just like OEM. I did not use the cam sensor. If you use this, you can move to sequential injection and coil-on plug style ignition. MS3X supports it. I used DIY Autotune’s MS3x wire harness and MS3 generic harness. About $125 in wires along for a 10′ section. I then stripped out the wires that I don’t need. The DB37 connectors that are crimped, you just push them out (takes a bit of force) with an appropriate screwdriver (very small). HERE is my final wiring diagram. I installed it under the passenger seat. I used part of the 2rz harness that I bought and wired this into the MS3X harness. 4 wires (one per injector) + 12V switched source. To “fire” injectors MS3X grounds the wire. Order is critical as I enabled sequential injection. Red (12v source, I added this, it connects to all 4 injectors) – this goes to a 12V switched source or the 4runner resistor box 12V – you need to remove that resistor box if you use high impedance injectors. 1 Pings/Trackbacks for "Megasquirt Planning for a 1999+ 2RZ or 3RZ"